The friends, I'd say ladies in their mid 40s (forgive me if I'm wrong no offense gals) both agreed that this was a political hit job. They'd never seen anything like it. Suddenly a client 2 seats down piped up too. #KavanaughAccuser #HoldTheVote Early 20s. Uh oh, I thought. 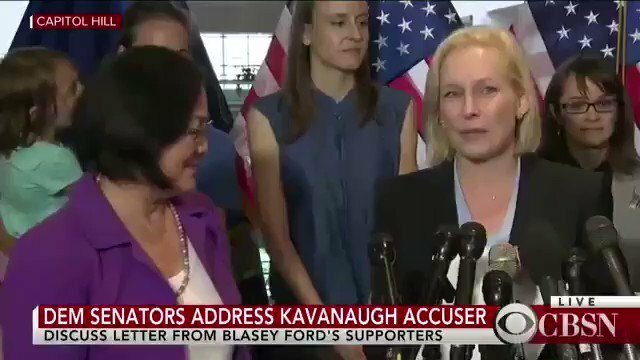 So Dr Ford is "confused" and "mixed up" about what happened 35 years ago but Brett Kavanaugh's memory of the same incident from 35 years ago is perfect and crystal clear? When men, decades later, report abuse by priests they are believed, increasingly there are state investigations despite the statute of limitations having lapsed decades before they go public. Whereas, Women who come forward decades later are "confused" or "lying." 3) Blasey works for a company called Red Coats. VP Business Development. — “Red Coats” strikes me as a very deliberately chosen name.